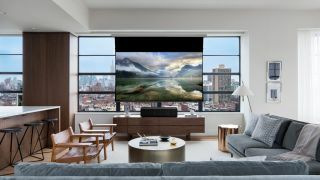 Best Projector Buying Guide: Welcome to TechRadar's guide to the best home cinema projectors - featuring both 4K and HD models. Like the HT2550, the main selling point of the BenQ TK800 is that it supports faux-4K by using XPR technology that essentially takes a 1920x1080 pixel DLP chip and flashes the image four times in incredibly fast succession to create an image with a perceived resolution of over eight million pixels. What's different about it is that it's also really bright, which means that even with SDR content it can deliver images that have genuine impact, even in less-than-ideal conditions. As such you can use the TK800 in a room with white walls or big windows, and still enjoy a huge projected image. On the debit side, the black level and the shadow detail are both poor, and the TK800 also uses a color wheel, which restricts its range of colors, especially where HDR is concerned. It also means that certain people will see ‘rainbows’, but that’s just a limitation of single-chip DLP projectors. On top of all that, it's quite noisy thanks to both the color wheel and a fan, although the latter is necessary given the amount of heat generated by the bright bulb. Native contrast of 40,000:1 makes blacks looks truly black... that is, if you treat your cinema room to a nice, dark paint job. Similar to the BenQ HT2550 and TK800 listed above, this beamer uses JVC's eShift technology, which projects two different 1080p images sequentially at 120Hz frequency, making up the detail of a native 4K display. Don't worry, in-person you'd be hard-pressed to tell the difference between this and 4K. Now selling for $1,799.99 (£1,799.99), this very large projector is based around Epson's own 3LCD engine and it deals in 4K, HDR 10, 3D, it has an electronic lens, an auto-focus system, and it can reach 2,400 lumens brightness. What prevents this from being higher on our list is that doesn't offer the greatest feature-set around – even Epson offers models with more bells and whistles (notably its step-up EH-TW9400, which adds Hybrid Log Gamma, 4K/60p HDR at 18Gbps, and Epson's 4K WiHD wireless transmitter), nor is as ultra-detailed as native 4K projectors – but the massive 4010/EH-TW7400's combination of must-have features and uncompromisingly cinematic images is impossible to argue with. However, we did miss a few luxury touches that a projector this price should include: The remote control is the same as you’d find on a projector a sixth of the price (and includes some button that have no function), and there’s no motorised zoom, focus and lens shift. All of these would've added a more polished, professional feel, which high-priced products like the UHD65 should always offer; it shouldn’t just be about new technology. "LG's minibeam projector is a great way to bring big screen entertainment to smaller spaces." The era of 4K was once only ruled by TVs, with projectors only joining the fold with large and pricey models. The BenQ W1700 is a surprising new addition for the company, and what’s even more surprising is the fact that it puts 4K projectors at a much more accessible price point than ever before. Yes, there may be one or two flaws that projector purists will nag about (hence its location on our list), but if you’re looking to finally set up your own private cinema in the comfort of your home, this is the place to start.